Montgomery County planners have drafted a sector plan for the Takoma Langley Crossroads area that will reinforce the community’s best features, such as its vibrant mix of small businesses and affordable housing opportunities. The plan incorporates pedestrian safety, transit improvements, community facilities, parks and open space. The community’s multi-cultural population makes Takoma-Langley an ideal place to support outdoor gathering places, recreational opportunities, mixed residential and retail, and new jobs. When the Planning Board submitted its draft in September 2010, it recommended the original C R Zones on all commercially zoned and developed properties. In January 2011, the County Council asked the Planning Board to consider amendments to the plan to reflect proposed changes to the CR zones so the draft plan will reflect current zoning recommendations. 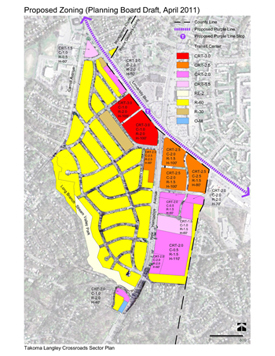 Staff recommended — and the Planning Board on April 7 approved — the use of theCommercial Residential-Town (CRT) Zone on all commercially zoned and developed properties. View revised zoning map. Prince George’s County planners have developed a plan for the part of the Takoma/Langley Crossroads that falls within that county. The planners, also part of the Maryland-National Capital Park and Planning Commission, are working closely across county lines to ensure compatibility. 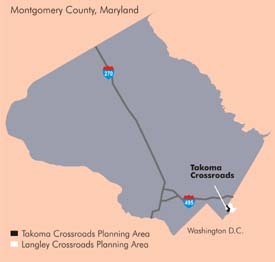 While Montgomery and Prince George’s county planners began a joint planning process in 2007 for the Takoma-Langley Crossroads community, the team later split to work on individual county plans. The Purple Line, a transit system slated to run from New Carrollton to Bethesda through Takoma/Langley, poses a great opportunity to encourage development that emphasizes walking, bicycling and public transit use. Moreover, state transportation officials plan construction of a bus transit center that will consolidate eight bus stops, furthering goals for pedestrian safety and improved transit. The plan will create a 15-year vision that prescribes the land uses and enhances the character of the multi-cultural community. Planners develop master and sector plans to create a framework for each community designed to last 15 to 20 years. Those visions help planners and policy-makers – such as the Planning Board and County Council – make policy and decide on proposed development. 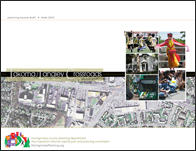 Each sector plan includes an inventory of land uses and an analysis of zoning, transportation, community facilities, environmental assets, and historic structures, among many other elements. Created nearly 40 years ago, Montgomery County’s General Plan defined the land use concept “Wedges and Corridors” a regional plan that envisioned growth corridors radiating from Washington, D.C., like the spokes of a wheel. In between each spoke, wedges of open space, farmland, and residential areas prevail. Transit station areas – such as Takoma Crossroads – provide opportunities for vibrant, compact, walkable communities. Let us know what you think about how Takoma Crossroads should grow, what changes are needed and what should be retained as redevelopment occurs.